Worldwide Statistics: Eight thousand people a day die from air pollution. There are 3 million annual deaths, worldwide. In Canada toxic emissions from transportation continue to rise drastically. 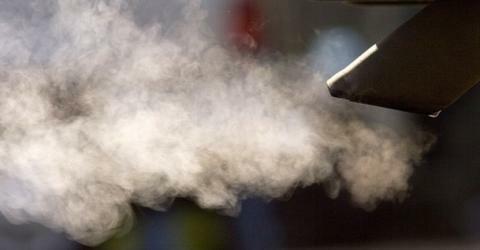 Vehicles are the primary sources of nitrogen oxides, carbon monoxide, particulates and benzene, a carcinogen. In the past 15 years alone, there has been a fourfold increase in asthma in children under 15 in Canada. In fact, the Ontario Medical Association estimated that health care costs caused by poor air quality in 2000 would amount to nearly $630 million, not to mention the $566 million in costs due to workers taking sick days. We are in a world wide public health crisis epidemic as a direct result of air pollution amidst a climate change crisis that threatens human survival on this earth – expanding services which promote unnecessary idling for convenience is not only reckless and irresponsible – it is the absolute opposite direction we need to be taking. Smog will hasten the deaths of 348 London-Middlesex residents this year and take a toll of 9,500 province wide, the Ontario Medical Association warned today. “It is actually a little worse than what we have found before,” said Dr. Ted Boadway, a health policy consultant with the OMA. The London region is home to some of Canada’s dirtiest air, much of it blown in from the U.S. industrial midwest, with homegrown sources – from traffic to coal-fired electricity generation – accounting for much of the rest. The OMA developed its estimate of premature deaths for individual areas from Environment Canada air pollution data, hospital emergency visit information and health studies during smog events. Out of the 9,500 Ontario deaths, more than 1,000 are expected to occur during or immediately after periods of increased pollution. The rest of the premature deaths are attributed to long-term exposure to air pollution. Boadway said numbers for London-Middlesex are higher than in many areas because the region is susceptible to smog moving north across Lake Erie and northeast from the Windsor-U.S. areas. “You can get it from two different wind directions, which makes it unfortunate,” he said. The OMA study said rural areas aren’t exempt from smog and in some cases the air quality in the city is better than in less urbanized areas. -Reduce strenuous outdoor activities or confine them to early morning or evening. -Drink fluids to stay hydrated. -Stay in a cool, clean, air-conditioned place if you’re vulnerable to effects of smog. -Speak to your doctor about how best to manage if you suffer from respiratory or cardiac illness. -Know your limits and pay attention to how you’re feeling. Boadway said there’s more public awareness about the health effects of smog than there was 10 years ago when the OMA first started studying the problem. “When we first started to talk about this, quite frankly, it was likely speaking into an empty room. People weren’t tuned in,” he said. John Miner is a Free Press reporter is a Free Press reporter. Air pollution causes 9,500 premature deaths a year in Ontario, new research suggests. Data from the Ontario Medical Association says that smog causes a worsening in respiratory and cardiac illnesses and contributes to earlier mortality as a result. The OMA’s Illness Costs of Air Pollution model finds that of the 9,500 premature deaths from air pollution, 1,000 occurred immediately after times of intense pollution. The model uses air pollution levels, rates of illness and demographic data to project air-related premature deaths for 2008. The areas with the highest numbers of smog-related deaths in Ontario were Toronto, with 2,130, Peel Region, with 700 and York Region with 590. “The health impacts from smog range anywhere from itchy eyes and sore throats to respiratory and cardiac illnesses and even premature death,” said Dr. Ken Arnold, president of the OMA, in a news release. He urged Ontarians to take steps to protect themselves by minimizing their exposure to poor air during times when air warnings are in effect. That includes refraining from strenuous exercise or limiting time outdoors to early morning or evening, when smog levels are lower. It also means people should drink liquids to prevent dehydration, stay in cool, air-conditioned environments as much as possible and to take preventive steps if they have chronic health problems, such as increasing medication on the recommendation of a physician. ‘It’s important for those who may be more at risk from smog-related illness to consult their doctor on how they can stay protected,” said Arnold.